Remember over the summer when I vowed to go through one box a week until our basement was decluttered? Well, I lasted a solid 2+ months but eventually life took hold and I’m now averaging about a box every month. But hey – I’m still at it! And this month I’ve decided to put the challenge in overdrive and tackle one of the hardest boxes yet – the one labeled “memories from childhood,” yikes. 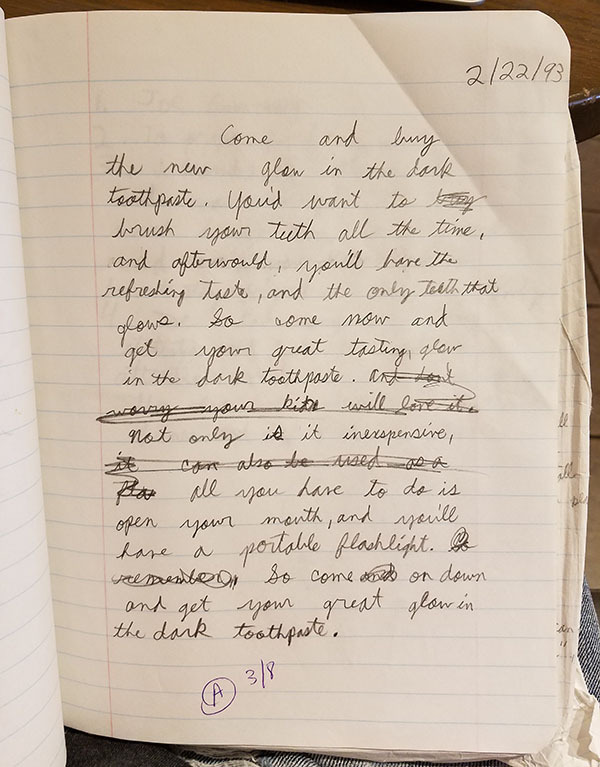 I’ve done a decent job ridding some of it already (it’s helped to make a “maybe” pile to come back to every now and then and remind yourself they were all memories probably best forgotten, haha…), but the best part so far has been finding all these notes I wrote as a kid. I’m only 1/10th of the way done but man it’s wild seeing some of this stuff… Definitely slows down time a bit, that’s for sure. You forget how you thought about life back in the day! But real reason I’m sharing this today is because I’m pretty sure I just came up with the BEST idea ever for repurposing childhood stuff. 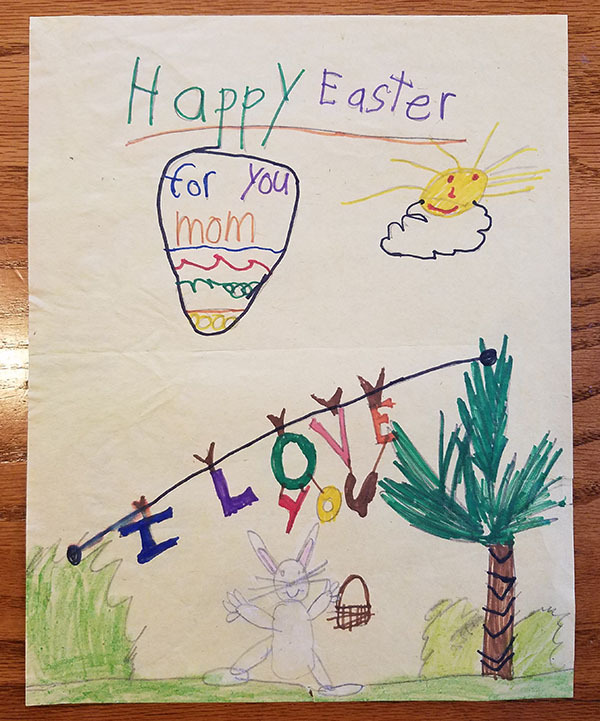 Among the old notes and doodles from school, apparently my mother thought it would be nice to store some of the old cards I made for her and my father too – particularly around the holidays. And rather than throw them all out which I was about to do, I thought – what if I can reuse them? Instead of buying another Hallmark card each holiday, what if I actually gave these hand-made cards BACK to my parents as if I were still that same 10 or 13 year old boy? And pretend no time has passed at all? Wouldn’t their hearts just explode with memories and be so much more meaningful? And bonus win: it wouldn’t cost a thing! But of course the real gift is priceless: sending your parents back in time to remember all the good times you had together! What’s better than that?? The memories that keep on giving… gotta love it. That is one of the best ideas. Ever. I have always hated buying cards. It’s such a waste of money and they always get tossed in the trash. 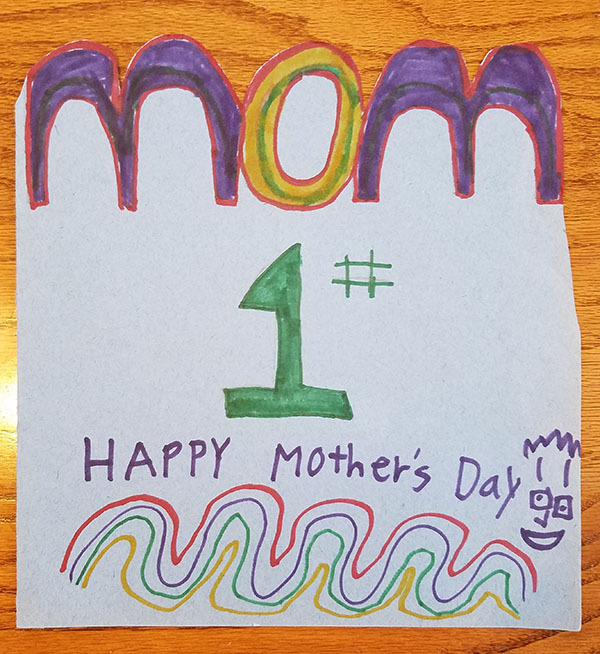 But homemade cards – I have every single one my daughter has ever given me. 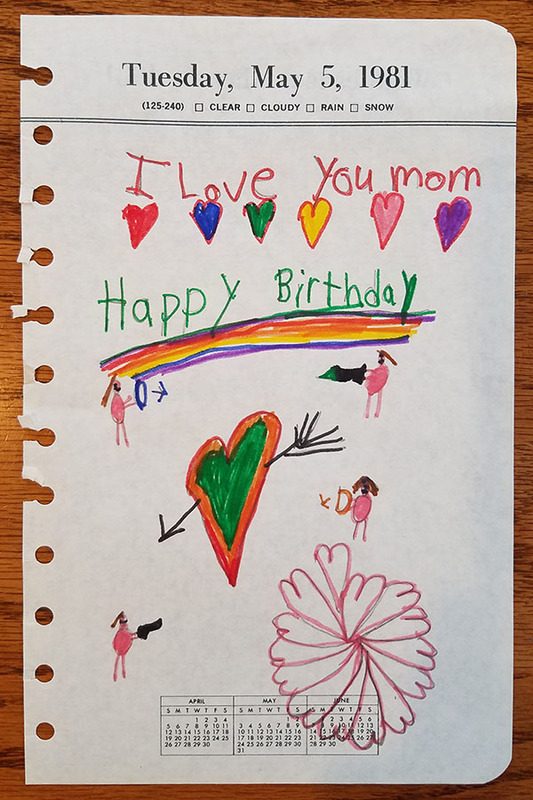 She’s 7 now and she’s still in the make-a-card phase which I absolutely love. Brings tears to my eyes whenever she gives me one. You must report back on how your parents respond over the course of the year! Haha what a great idea! I have some boxes of childhood items too and wonder what I could come up with. It’s always hard to come up with gift ideas to parents anyway but they’d love a memory like that. Exactly. And I guarantee they won’t see it coming! Ummm…..unless they read your blog! Smiles. Love the pic with the copying machine, thank goodness it was your face you chose to copy. Since we have kids now we have been helping them make cards for their grandparents and we just sign it with/for them. 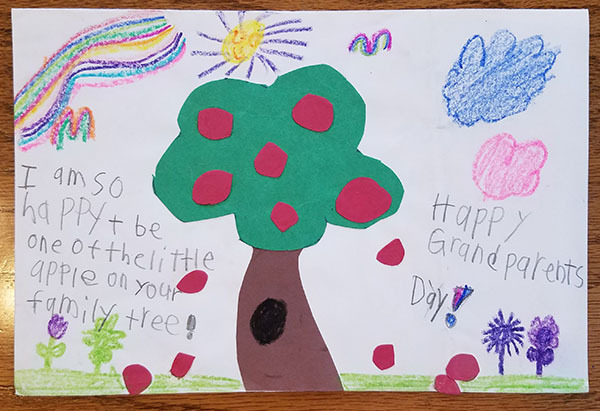 We figured that they would much rather have a card made by their grandkids than one I picked out from the store anyways. My wife’s family has a tradition of recycling hallmark cards. She still gets one from them she had when she was ten. After the day has past they return it. The next year it comes back with a new signature and date. They typically insert a handwritten note via an inserted piece of loose leaf. Probably not as epic as your drawings and letters from yesteryear, but I suspect it brings them the same memories. HAH! I was wondering how she was able to recycle them all :) I think at that point I’d rather just have the nice handwritten letter than same card over and over again haha… Def. clever though. Thai is so cute!! And seriously, the gun man? Weird kid. Perhaps this will start a little chain in your family and your kids will do the same for you! Oh, and I think I can speak for all of us when I say we are so glad that you can read and write! Those cards are great! I think your family will get a big kick out of them! That’s a good idea. I’m sure your parents will love experiencing the memories from when you were a child. Frugal tip- whenever I get to a 99c store, I stock up on greeting cards- good quality for 99 cents. Can’t beat it for those who still mail cards like me! Good idea :) I feel like I saw a ton of solid/cheap cards at Trader Joe’s the other day too – I’ll have to make a note to visit again once I run out next year! That was what sparked the idea to begin with! I was literally about to drop them in the trash when the light bulb went off :) Now it’ll be interesting to see what my parents do with them! Haha… I swear, if they give them back to me I’m not going to be happy. Hahaha, why does that guy have a gun……. This is a good idea! Now you should think of a way to re-gift some of the other stuff my parents sent back to us when we got our own house….. Pretty sure they sent me a bunch of crap that was in a “junk drawer” in my old room. My family has started bringing over boxes every other month or so at family dinners and asking if anyone wants anything before they donate them. I’ve offloaded a lot from there, as well as picked up a few things that’s saved me money or that i just really enjoyed. Could be another idea for ya! In a similar vein, my wife repurposes old cards we receive by cutting out shapes (hearts, animals, etc.) and saving them. Then our son puts together cards on construction paper with stickers and these shapes and we send them on. Instant memories, low cost, and our son loves the time making the cards. Win -win. That is a great idea! My 3-year-old would love that. In the past, we have cut up cards we’ve received and then used them as tags to attach to gifts we gave. We got that idea from my MIL who is the queen of repurposing. Not a bad idea either! Super creative. Such a great find! 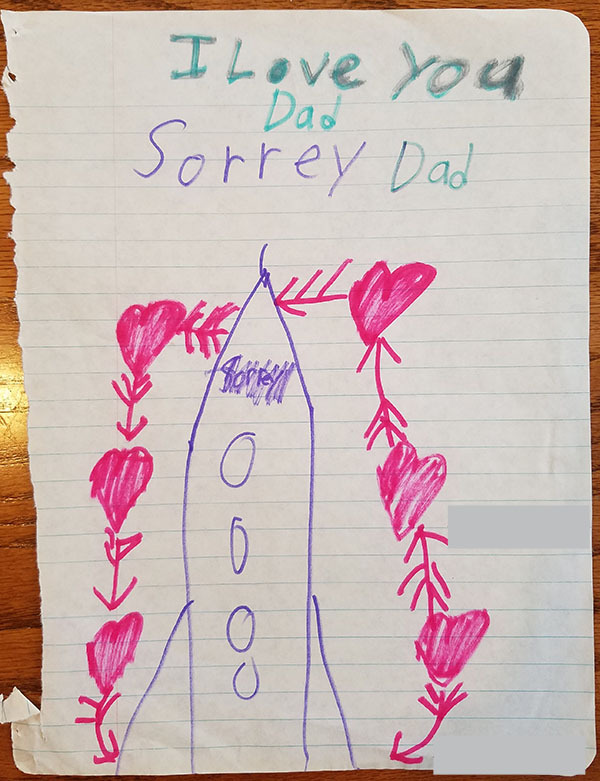 I wonder what the return rate is on those kid’s drawings you did in terms of appreciation and love from your parents. Probably pretty good! Why is it too that boys always add weapons to their stick figure people? That is so adorable. My mom might be the least sentimental person ever, so she might just be slightly annoyed. But I think it’s adorable. I want to start saving all the cards my kids make now! You parents are going to love this. 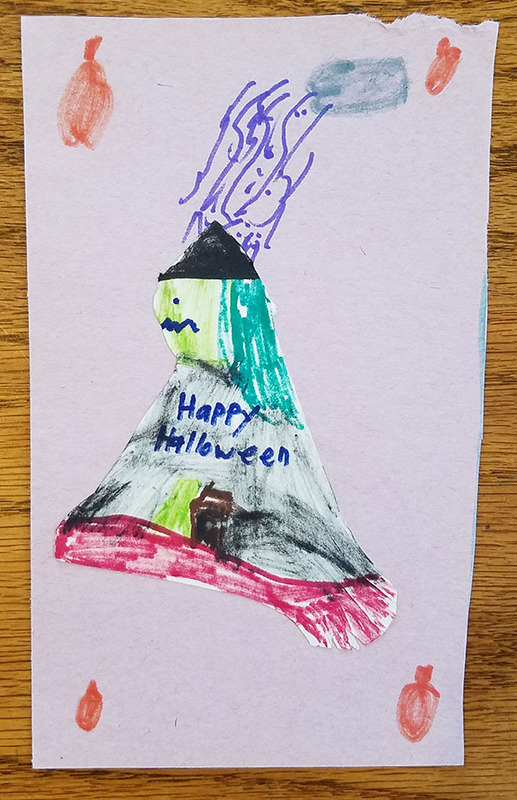 I loved the weird halloween card (what in the world is that creature?) 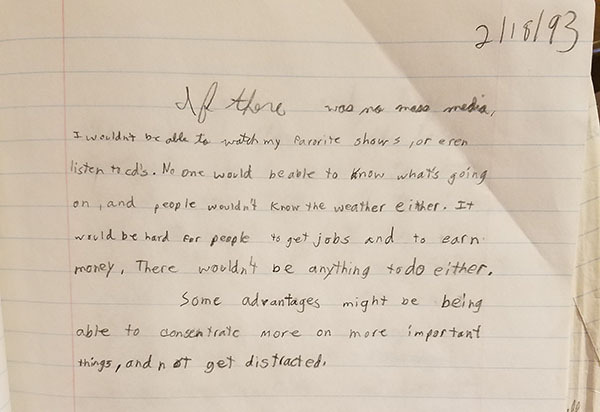 and the oh-so-insightful note about mass media. The last time I visited my in-laws Grandma BITA showed me some cards Mr. BITA had made for them as a child. On one of them he had drawn a ‘thermometer of love’ for each parent. His Dad got a 9/10 but his Mom only got a 3. She still gets really indignant about that score. Awwww, that is such a precious idea! I wish I’d hung onto my childhood work, but it got tossed during many moves. Bah! I save on cards by making them myself (with all of my magical free time of course) or buying them at Dollar Tree. They’re .50 at Dollar Tree and the cards are surprisingly nice. I need to stock up on stacks of birthday cards to have around the house for emergencies! Great idea! I don’t have any childhood stuff. We moved often when I was young and we didn’t keep anything. 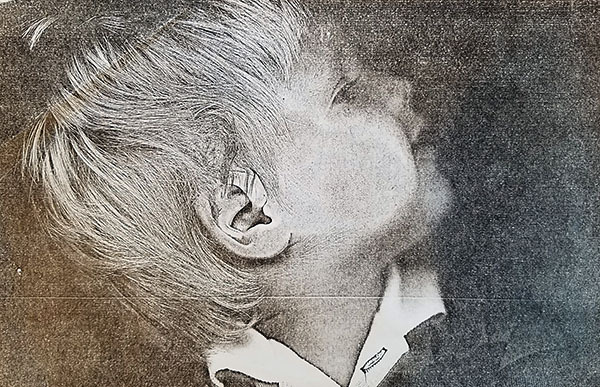 Even most of the old photographs were lost or at some relative’s house… We have a ton of our kid’s art projects that we could send, though. 1981 was a particularly good year. I do like your positive outlook on that kind of stuff. Mine was much more negative. I was actually upset when my mom gave me all my old stuff as an adult. I just don’t understand why she didn’t want it anymore. I viewed it as kind of a big F U.
Reusing those cards is an adorable idea. I bet family would far prefer those. We’re moving, and are similarly getting rid of a TON. We’re doing a few boxes a day, often dropping off whole car loads to Goodwill a couple times a week, selling stuff on craigslist & ebay…lots of good feelings from having less. That Minimalists movie did a number on us! Oh good!!!! I only got halfway through it cuz it was soooo slow and already believe in it all so much, but I still want to finish it up and see if any other gems stand out. Where are you guys moving to? What an awesome concept! I’m sure my parents have our stuff stashed somewhere and they would get a kick out of it resurfacing all these years later. Sometimes it’s the things that don’t cost any money that are most valuable. I wonder if you could scan a bunch of the cards and made them into a t-shirt or blanket? Might be another cool, inexpensive way to use them again. This was a nice trip down memory lane. Thank you, sir. This would be sure to work well to create nostalgia city! Good for you for actually trying to tackle your childhood box! I don’t think that we can even go near the stuff and try to minimize it! 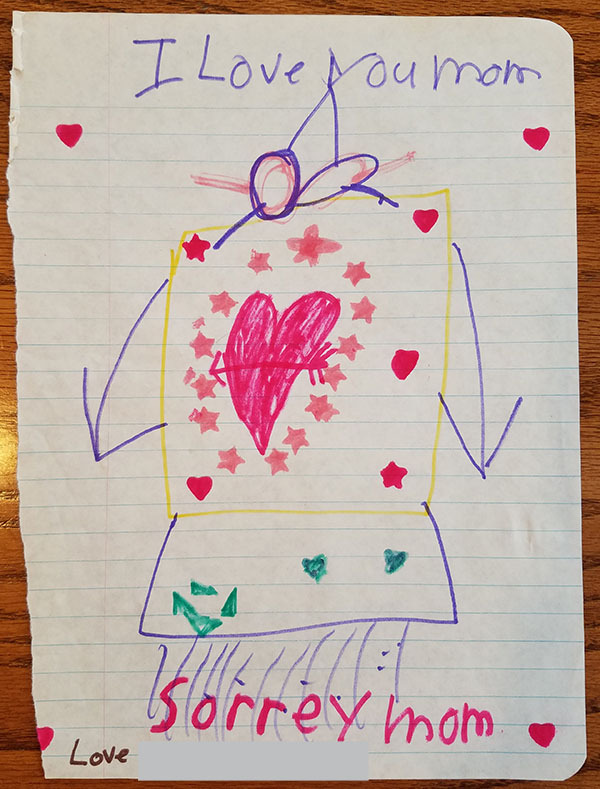 We have an ever growing collection of kid drawings and stuff that my 2 girls create each day and I just don’t know what to do with it all. I have set up binders and I’ve even started working on digitizing some of it as well! Ohh well, just thinking about it makes me not want to touch it or I might not get anything done for a few days LOL! Haha I know. We have a tub where I just throw it all into right now until we can figure out how to sort as well :) It’s one thing going through your own stuff, but man – when it comes to your kids I don’t know how people do it! All their art is so magical!! Oh god, I am practically in tears thinking about my children’s cards for me and imagining reading them 30 years from now. Thanks J. Money, I am now useless and incapacitated for the remainder of the evening. But seriously, what an inspired idea. Goose bump-imparting! Awww haha… aren’t you sweet today :) Really really glad you liked the idea – thanks for making my morning. Unfortunately, I haven’t really kept around many of my childhood items, but if I did, it would definitely be great to reuse those cards as gifts to my parents! Very impressed with your artistic talent as a kid. My fav was the flower petals made out of hearts. That is an awesome idea! You are recycling feelings and stuff! These are just darling!! What a great idea. This has really spurred me to want to save more of my daughter’s artwork- she’s always crafting but I usually don’t save that much of it. I’ll have to come up with a box to put her creations in. I did something else for my wife on Valentine’s day. I used a card left in the office from the previous occupant. It was real nice, played a song when you opened it. I glued some construction paper over the inside to cover the handwritten message and wrote my own. I don’t really have much old stuff to remember my childhood by anymore. I have my memories, of course, but when I went to visit ‘home’ last October, we discovered our basement was ransacked. We only found out because my dad wanted to do the same thing: go through the old boxes and declutter the place a bit. I’m still sad (and a bit mad) when I think about it, good thing my mom’s more sentimental and kept some old stuff inside the house. You really can’t put a price on sentimental value. I have been married to my BFF for 32 years. One time, I found what I considered to be the ‘perfect’ anniversary card for my husband – the picture on the front, the sentiments expressed and the way they were worded were all exactly as I would have created them were I the least creatively inclined. When he received the card, there were tears in his eyes. He loved it. Being frugally inclined (OK, in this case, let’s just call it CHEAP) and knowing that my husband has a tendency to be memory-challenged, I put the card away in the cedar chest and pulled it out the next year when our anniversary rolled around again. To my delight – the same reaction. I think this went on for three years before I couldn’t help it – I HAD to tell him. He admitted, rather sheepishly, that he hadn’t noticed a thing. 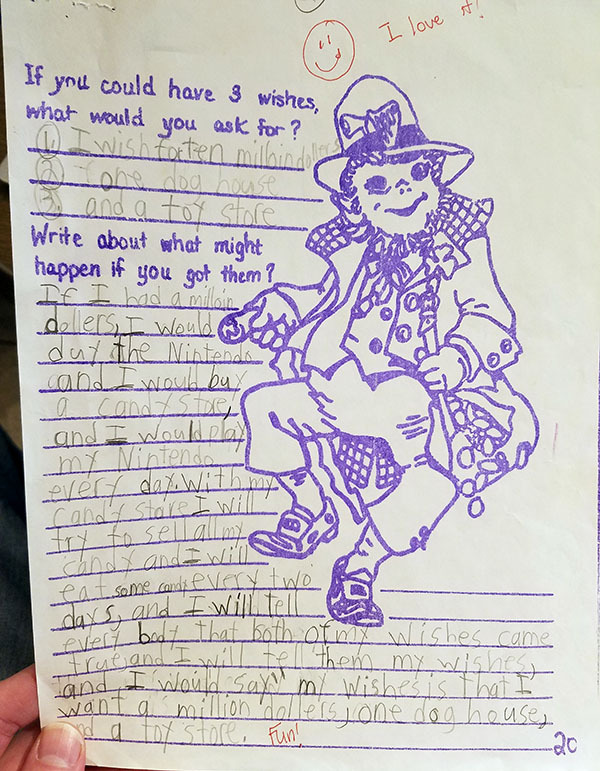 Even as a kid, you knew that wishing for just $1M was really a wasted wish. $10M was your “number” even then. Smart kid. Smart guy now. 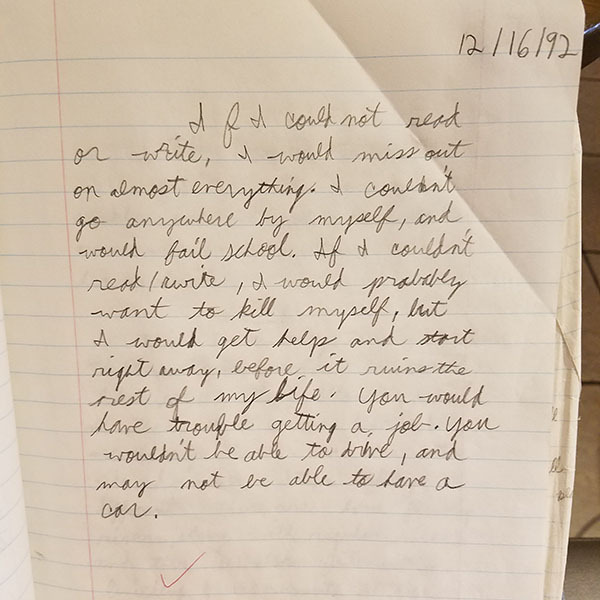 I went through a couple of boxes of my stuff from when I was a kid last fall when my parents moved from my childhood home. I love your idea, but unfortunately, I didn’t save any of it. I spent a few hours reading through it all (huge mind trip, by the way, to go back in time like that) and then tossed it into the recycling can. Similar to you, we have found it darn near impossible to get rid of the art our son creates. After he creates it, it finds its way to the fridge first, then into a box in the garage for safe keeping. You made us laugh with the gun in the middle of all this love!!! On my side I now feel bad to scan and upload to Dropbox *all* my kids’ drawings…like, I will receive a Dropbox link in 20y?! Damn! Great idea you share here anyway! This is such a sweet idea. Re-use the memories and the paper. Just put it into action for the first time last week for Easter.. 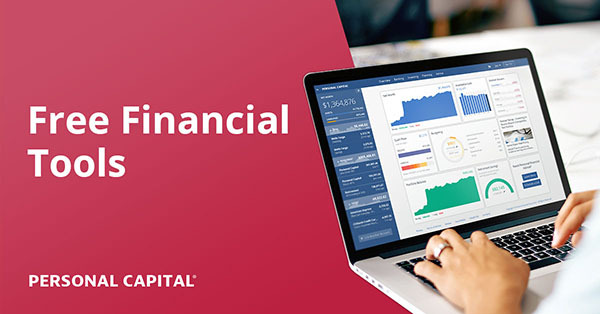 Previous post: Will New Financial App, Clarity Money, Kill Mint.com?